Physical oceanography is a sub-discipline of oceanography that involves the study of waves, tides, and currents; the ocean-atmosphere relationship that influences weather and climate; and the transmission of light and sound in the oceans. The scales of these processes range through spatial scales from centimeters to global and time scales from seconds to centuries. Physical oceanographers seek to understand why, where, and how water moves, and the consequences of these movements. Their work may include interdisciplinary scientific investigations of ocean temperature, salinity, density, circulation patterns, currents, eddies, gyres, coastal processes and tides, winds, and/or waves. Physical oceanographers may also study the interaction between the ocean and its boundaries (land, seafloor, and atmosphere) and the relationship between the sea, weather, and climate. They may also examine they physical mechanisms responsible for the distribution of sea ice and polar ice sheets. Ability to cooperate and collaborate with others- physical oceanographers often interact with other scientists, engineers, meteorologists, and government officials. When working in research teams, physical oceanographers have to effectively communicate to explain research results or other aspects of their work. 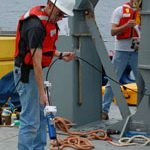 Physical oceanographers use a variety of tools, including basic equations, computer models, instrumentation that measures ocean properties, remote satellites, and surface radar. They use a combination of acoustical, optical, satellite, and direct ocean measurements and techniques to conduct their work. For example, ocean currents can be measured using acoustics. Acoustic Current Meters are used to measure the velocity and direction of currents and waves. An Acoustic Dopple Current Profiler (ADCP) uses the Doppler effect to measure currents in the ocean. It calculates speed of the water current, direction of the current, and the depth in the water column of the current. This instrument can be placed on the seafloor, attached to a buoy, or mounted on a boat. RAFOS Floats are floating instruments designed to move with a current and track the current’s movements. The RAFOS Float keeps track of its own position by listening for the signal from sound sources in the water near the study area. The RAFOS Float uses the travel times of the sound from two or more sources to determine its position. It can be designed to float at different depths, allowing the vertical structure of the current to be studied. Ocean temperature can also be investigated using acoustics. To measure the temperature of the water, a sound pulse is sent out from an underwater sound source and heard by a hydrophone in the water some distance away (up to thousands of kilometers). The time the sound takes to go from the source of the sound to the hydrophone is measured. From the travel time, the average speed of sound between the source and the hydrophone, which depends mostly on the temperature of the water, can be calculated. 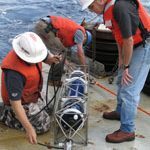 Acoustic tomography uses precise measurements of acoustic travel times to draw ocean temperature maps, showing ocean temperatures just as weather maps show temperatures in the atmosphere. Inverted Echosounders (IES) are anchored to the seafloor and measure the temperature of the water column at a single point. A sound pulse is transmitted, reflects off the surface of the ocean, and returns to the bottom. The IES listens for the return of the sound pulse from the ocean surface. The travel time of the sound is used to calculate the average speed of sound through the water, which is used to derive a temperature profile. Dr. Peter Worcester received his B.S. degree in engineering physics from the University of Illinois, Urbana, in 1968, a M.S. degree in physics from Stanford University, Stanford, CA, in 1969, and the Ph.D. degree in oceanography from Scripps Institution of Oceanography, University of California at San Diego, La Jolla, in 1977. He was also in the U.S. Navy from 1969–72. Dr. Worcester has been a Research Oceanographer at the Scripps Institution of Oceanography since receiving his Ph.D. in 1977. He was a Visiting Scientist at the Massachusetts Institute of Technology (MIT), Cambridge, MA, during 1983 and at Commonwealth Scientific and Industrial Research Organisation (CSIRO), Hobart, Tasmania, Australia, during 1989. His primary research interests are in acoustical oceanography and underwater acoustics. His work has focused on the application of acoustic remote sensing techniques to study ocean structure and circulation. He has been engaged in the development of the technique of ocean acoustic tomography since its inception, including the development and deployment of the required instrumentation. He has participated in numerous experiments applying the technique to oceanographic and acoustic problems in the North Pacific and North Atlantic Oceans, in the Greenland Sea, and in the Strait of Gibraltar. Dr. Worcester is a Fellow of the Acoustical Society of America, a Fellow of the Institute of Electrical and Electronics Engineers, and a member of Tau Beta Pi. He is a member of the AGU and The Oceanography Society. NOAA, Ocean Service: what does an Oceanographer do?